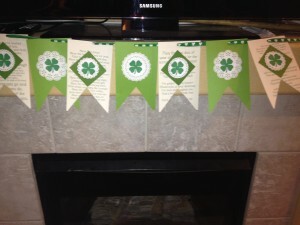 Happy St. Patrick’s Day, Free Printables, a Craft Project and More! Happy St. Patrick’s Day friends. 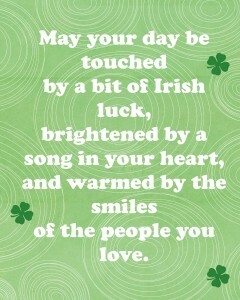 I hope your day is touched by a bit of Irish luck today. 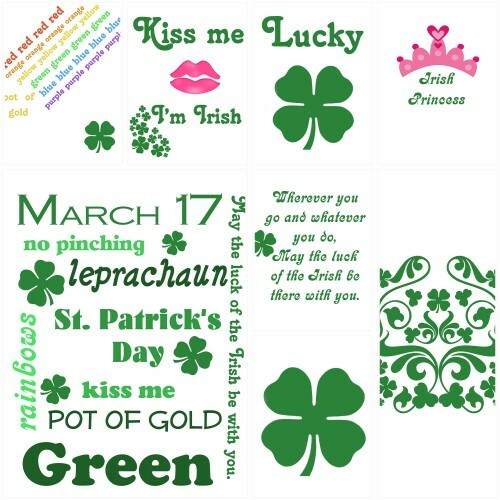 St. Patrick’s Day is a really fun holiday with children because you get to dress up, be silly and there are so many projects you can do with them, like Leprechaun traps, rainbow waffles and dye everything green! You can also go on scavenger hunts to find rainbow items in your house or look for clovers, Leprechaun’s and so much more. Being Irish myself, this holiday is a great day to talk to my kids about their Irish heritage. I wanted to share a few St. Patrick’s Day things in this post. Next, I made these printables so long ago that I nearly forgot to post them. So check out all the separate files here in our 4Shared Folder. The last thing I want to share is our project, I got this idea from this Pin and then somewhat made it my own. Instead of using old book pages, I used Irish proverbs, which the pages I used are in the printables folder. Then, I added a couple of blank green pages, printed some small shamrocks, and topped each page off with a little doily from Martha Stewart’s Craft line. 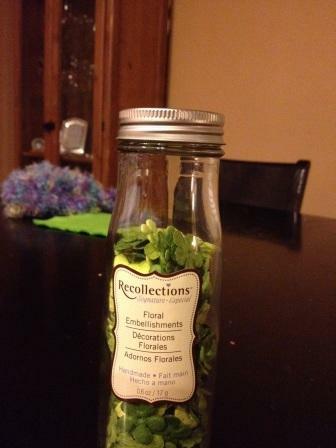 Similar to these Martha Stewart Crafts Tags Die-Cut Lace). They turned out really cute. Then, I simply added them onto a ribbon to hang. They should last our family several years. The other craft we made was something really fun for my daughter. 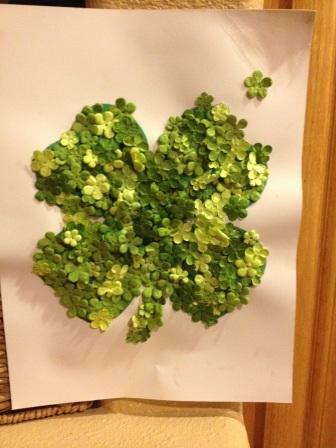 I pre-printed a shamrock on some card stock and then put the glue all over the page, then let her place all the little flowers all over the page. She did a great job and it was a nice evening project that didn’t get us too messy. So there it is….our projects for a lucky day! Happy St. Patrick’s Day and may the luck of the Irish be with you today!!! Ainsleigh chose Tyra…congratulations Tyra, you will be receiving a copy of Oh, the Places You’ll Go! Now for our second winner, chosen by Nolan…congratulations Kathi, you will also be receiving a copy of Oh, the Places You’ll Go! Thank you everyone for sharing our blog this past week and celebrating Read Across America and Dr. Seuss’ birthday with us. We had such a fun day today. This morning, I took my daughter to a friend’s Kindergarten class to deliver a set of laminated Dr. Seuss bookmarks for each of her students to celebrate Read Across America week. We stayed for about an hour and read two books (There’s a Wocket in My Pocket! and Fox in Socks ). We also worked on two rhyming worksheets and visited with all the kids in the class. Our daughter was so excited about getting to go to "big kids" school she didn’t want to leave when it came time to go. The bookmarks thrilled the students and they had such a fun day. I think the poster all my teachers had in their rooms must be true “All I really need to know, I learned in Kindergarten”, because Kindergarten is so cool. When we got home, we read a few more books with our son so he could share in the awesomeness that is Dr. Seuss.